A New way to receive Trojan Thursday is here. Please help spread the word about Trojan Thursday. If you would like to receive Trojan Thursday each week please go to https://unitrojanthursday.wordpress.com and type in your email address. You will receive a notice each week when Trojan Thursday is posted. Athletic Trainer Funds – As most of you know money is always tight in the athletic department. This goes for the funding of the athletic trainer and supplies to treat our student athletes. This week we purchased a golf cart for our athletic trainer so she can bring all the necessary supplies with her to our athletic events. We are asking parents for donations to help us pay for this golf cart. If you would like to make a donation please drop off a check to the athletic office. Make all checks out to University high school. In the memo line please not athletic trainer fund. We would like to give a big thank you to our UNI PTSA for their $1500 donation to the athletic trainer fund. This money will go to off set the cost of the cart and help Brittney purchase supplies that she despertaly needs. Baseball – Last Friday Varsity Baseball lost to Woodbridge 8-1 . Max Juang had two hits and Maverick Freedlander , Will Faure and Riley Smith each had 1 hit. On Tuesday, Sophomore Jacob Collins pitched a 5 hitter and beat the #3 Team in CIF Beckman 3-2 . Will Faure had 2 hits and Tomer Reuveni had a big rbi. Alex Uy squeezed bunted freshmen Andy Masotto for the winning run. What a great win for our baseball team. Our boys are @ CDM tomorrow afternoon. Good Luck Baseball! Boys Golf – The boy’s golf team had a big win on Tuesday versus Woodbridge, who is ranked #1 in the county. We won 181-182 at Strawberry Farms. Junior Koichiro Sato shot a -3 (33); Sophomore William Tse shot 35; and Freshman Griffin Pace shot even par 36. The team record is currently 7-1 overall, after beating El Toro last Thursday at Strawberry Farms and yesterday at Mission Viejo CC. Our boys are back hitting balls today as they battle Beckman. Boys Lacrosse – Although boys lacrosse had two tough losses this week against Woodbridge and Beckman, there have been some standout first year players, leading the Trojans both on and off the field. Goalkeeper, Babak Ghadaksaz and defenseman, Amir Javadi have shown true leadership and have become the anchor on a defense with star Joseph Hwang. Additionally, freshman, Nick Khamseh scored for the first time in what looks like a long line of goals to come. Baeksun Kim has continued his stellar performance in the face off circle, with a winning percentage at the top of the league. Girls Lacrosse – Girls Lacrosse opened league play this week against two of the strongest teams in the county, Woodbridge and Beckman. Although the team lost both games, the girls played very well. Against Beckman, our ladies generated the first two shots on goal, with one ricocheting off the post! Sarah Verdegan lead the team in goals against Beckman, netting 3, and Amanda Shubin netted two goals against Woodbridge. The team also played a non-league match against Sage Hill, and what a nail-biter! The girls gutted out a win, 13-12, scoring in the last minute and a half and then possessed the ball despite a ton of defensive pressure to secure the victory. Our ladies are back in action next week away against Corona del Mar and home against Northwood. The game next Wednesday, April 1, is the Game of the Week (no kidding!) so come and support the team! Softball –Our girls continue to play pre season ball. our girls will be on the field next Tuesday @ Costa Mesa. Good Luck next week softball. Boys Swim – It was a great week for the Trojan Boys Swimming program. Our boys claimed first place at the CIF Southern Section Relays this past weekend at the Los Alamitos Joint Air Force Base. We took 10 first place finishes out of the 14 races. Daniel Tran, Andrew Knoell, Matt Wong, and Judd Howard won the 4X100IM. Howard, Matt Yong, Wong, and Chris Havton won the 4X50 Breast. Tran, Knoell, Austin Yan, and Jarod Yoshihara won the 4X50 Back. In the 200 medley, Tran, Howard, Knoell and Will Hofstadter got first place almost breaking the meet record we set from last year. Congratulations to Daniel Tran for being recognized as the OC Varsity’s Athlete of the Week! Tran was awarded the honor due to his outstanding performance in the CIF Southern Section Relays. All three of his relays got first places. Yesterday the boys had their first League meet against Woodbridge High School. Our boys cruised to a victory. Some impressive performances from Varsity were Ken Takahashi earning a first places in the 100 freestyle and 100 Breaststoke with CIF consideration cuts. Daniel Tran was first in the 200 freestyle and 100 Back with CIF Auto Cuts. All three relays got first place with the 400 Free relay earning a season best time 3:09.36 and CIF Auto cut. Ken Takahashi, Will Hofstadter, Daniel Tran and Andrew Knoell were on the relay. Go Trojans!!! 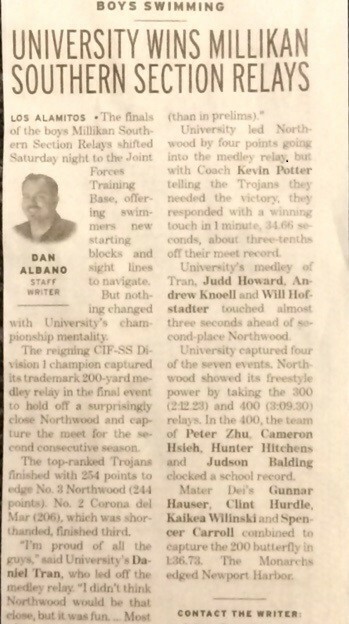 Below is an article from the OC Register about our boys winning the Millikan relays last weekend. A picture of our boys after the event with their championship plaque is below the article. Girls Swim –Yesterday at Woodbridge. Kathy Lim got her consideration time in the 100 fly. Anne Jang also got her consideration time in 100 back.Last Saturday we had our first dive meet and Beth Bushey got her consideration score with 331 points! Our girls will be swimming in the Millikan relays today and Saturday. Good Luck Swimmers. Boys Tennis – Uni boys varsity tennis moved to 6-2 with a league win over Woodbridge, 15 to 3. Tommy Wang and JT Joens swept at 2nd doubles for the Trojans. Kayvon Dejbaksh and Akhi Anish won their two sets at first doubles. The boys will take on Beckman at home on Thursday. Last weekend the Uni boys took part in the National All-American tennis tournament in Newport Beach. The boys lost the opening match to Bellarmine College Prep from Northern Cal, 4-4 in sets but lost by 3 games. The boys went on to win three straight matches defeating The Iolani School from Hawaii 6-2, Brophy Prep of Arizonia 7 to 1 and the Beacon School from New York 6 to 2 to win the Consolation Championship. Konrad Kozlowski was named to the “All-Tournament” team. Girls Track – Last week the girls track team competed at Huntington Beach High School. Our varsity team narrowly missed a victory, with a score of 64-67. Senior Sarah Stern and junior Sonia Lin took first in the 1600 m and 100 m hurdles respectively. Freshman Paige Metayer took 1st in the 400 and 800 m, and continues to be an athlete to watch out for. Senior Caroline Werth placed first in the 200 m and long jump. Melissa Lee (junior) threw a solid distance of 107’ 3” in discus, resulting in a 1st place finish. Last Saturday we had Sofya Ogunseitan, Leyna Wood, Sarah Stern, Sonia Lin, Shaneen Zamanian, Melissa Lee, and Sara Elgohary representing UNI at the Asics Laguna Beach Trophy Invite. All of these athletes worked really hard and put out a great performance. This Thursday begins league with a dual meet against Woodbridge at our stadium. Come out and support these fantastic athletes! Boys Volleyball – Our boys will open up league play tomorrow afternoon v Woodbridge. Good Luck Volleyball. Below are links to three interesting articles about the importance of playing multiple sports. There is a national trend of athletes trying to concentrate their abilities on just one sport. Read these articles to see what well respected college and pro coaches think about this trend. You may think that focusing on one sport is best for you but college coaches are recruiting athletes who play multiple sports. ASB Election Convention – Congratulations to Sophia Bajak and Kiron Dey who were elected as the girls and boys sports commissioners for next year. They will begin work immediately to help publicize our athletic teams and will work on new ideas for next year. Girls Lacrosse v Northwood – 4:00 – THIS IS THEIR GOW- Come out and support our girls! Below is the Spring Game of the Week schedule. Mark your calandars and come out and support our UNI athletes at these big games. As most of you know money is always tight in the athletic department. This goes for the funding of the athletic trainer and supplies to treat our student athletes. Last week our athletic trainer golf cart broke down and we are doing everything possible to supply Brittney with a new golf cart so she can bring all the necessary supplies with her to our athletic events. I know it seems like we are always asking for money but this golf cart is extremely important for our athletes to receive the best possible treatment. We are asking parents for donations to help us pay for a golf cart. If you would like to make a donation please drop off a check to the athletic office. Make all checks out to University high school. In the memo line please not athletic trainer golf cart. Word got our yesterday about our golf cart breaking down and we received a very generous donation this afternoon from the Masterson family. What a great way to kick off this fundraiser. Thank you Masterson family for your donation. We hope it is the first of many donations. Baseball – Our baseball team has been working hard all week as they open up league play tomorrow afternoon v Woodbridge. Good Luck boys. Boys Golf – Our boys lost to Beckman this past Monday, 182-198 at Tustin Ranch Golf Course. That makes us 0-1 in league. We beat Mission Viejo at Mission Viejo Country Club Tuesday, 191-194. That keeps us undefeated against nonleague opponents, 4-0. Our overall record is 4-1. Koichiro Sato has been playing really well. He was one over par (37) on Monday at Beckman and one under par (35) Tuesday at Mission. Our boys will be back on the course taking on Woodbridge next Tuesday. Good Luck Golfers. Boys Lacrosse – This afternoon is the Boys LAX GOW. Come out to the stadium and support our boys as they open league v Sage Hill. Game time is 4:00. Good Luck Boys! Boys Lacrosse finished their preseason with a spirited game against Tustin HS last night. The boys were down 5-3 at halftime, but came out of the break with great composer and tenacity. UNI scored two quick goals with Taavi Taagepera scoring the first and senior co-captain Baeksun Kim adding the next. The crowd was amazing and cheering the entire game, they definitely got their money’s worth as the game went into the last minutes with UNI down one, 7-6, and trying to get the tying goal. UNI had great opportunities and took excellent shots but hit the pipes of the goal 3 times to end the game 7-6. The team has had a great preseason and has improved tremendously. We hope to see everyone out at the stadium this afternoon as our LAX team kicks off the Game of the Week schedule. Girls Lacrosse – Girls Lacrosse wrapped up their preseason with a win over Valencia, 9-5. Their record was an impressive 7-2; this team continues to make history already earning more victories this year than last year. The offense continues to be bolstered by the outstanding play of Kathy Guo, who is averaging 4 goals a game and currently leads the team in scoring with an impressive 32 goals. However, the dynamic offense that UNI possesses was on display last night when goals were added by Anneke Gustafson, Jenny Bardwell, Amanda Shubin, Ashlyn Wang, Honia Motashami, and Sarah Colunga. Lily Huang, goalie, kept Valencia from getting in to the game by recording 10 saves. The defensive side of the field was anchored by Jackie Villalvazo, aided by outstanding performances from Jenny Bardwell, Sarah Colunga, Kerri Luttrell, and Mackenzie Zambo who all effectively shut down Valencia’s best goal scorer. League play starts on Monday, March 23rd, with an away match against Woodbridge, and then the girls are in action at home on Wednesday, March 25th, against league powerhouse Beckman. Come out and support the girls! Softball –Friday night the Varsity Softball team beat CDM 18-7 with Mia Maher adding another four stolen bases! Centerfielder Kim Nguyen laid down a perfect bunt to move Alyssa Hernandez who led off with a single, that turned into a three base error scoring both girls! Freshmen Janette Oh shined again on the mound and at plate going 3-3 with six RBI’s. Freshmen Zoe Manjarrez stayed hot as well with two hits including a double and 2 RBI’s. Saturday the girls played San Juan Hills again for 3rd place in the Costa Mesa Tournament but lost 11-2. Tuesday the girls played the 3rd game of the La Quinta tournament, losing to Orange, but with two wins already in pool play advanced to the Championship game which they will play today at home against Westminster at 3:15. Good Luck softball! 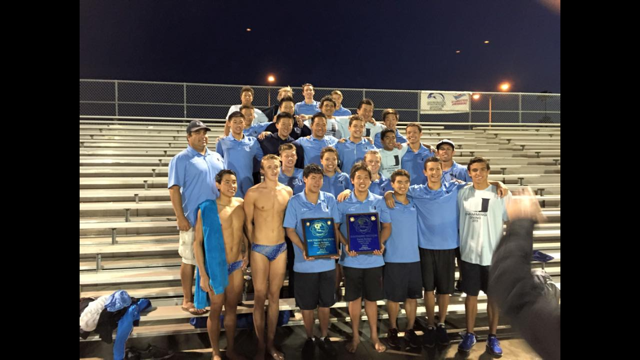 Boys Swim – Congratulations to the University Boys Swim team for being ranked #1 in the OCVarsity.com preseason poll. The boys will be swimming in the CIF Millikan Relays this Thursday and Saturday in pursuit to defend their CIF Relay Championship from last season. GO TROJANS!!! Girls Swim – Our girls swim team has been training hard this week as they prepare to open up league next Wednesday. Boys Tennis – The Uni boys tennis team moved to 5 and 2 on the season. The boys defeated Tesoro 17 to 1 last Thursday. They boys won again on Tuesday defeating Fountain Valley 16 to 2. Senior Rohan Lageweg and freshmen Naevin Anukornchaikul won all three sets playing singles. The team will take part in the National All-American Tournament on Friday and Saturday. League play begins next week with matches against Woodbridge and Beckman. Girls Track – Last Thursday the track team hosted its first home meet against Godinez High School. The Girls track team had impressive performance. Varsity won with a final score of 81 to 35. On Saturday, we had 4 girls participate in the Irvine Invitational at Irvine High School. Senior Caroline Werth took 4th in both the varsity Triple Jump with a distance of 33’-09.50” and Long Jump with a distance of 15’-11.50”. Sarah Stern (senior) ran the 1600 meter with a time of 5:38.15 and the 800 meter with a time of 2:30.77. Junior Melissa Lee took 8th place in the varsity Discus throw with a distance of 101’-08”. Sonia Lin (junior) competed in the varsity 100 meter hurdles finishing 2nd in her heat with a time of 17.69 seconds. Watch for these ladies in the top 100 of the CIF- Southern Section. Currently, Sonia Lin is #52 in the hurdles, Melissa Lee is #34 in the discus, and Caroline Werth is #74 in the Long Jump and #34 in Triple Jump. Our next meet is Thursday 3/19/15, away at Huntington Beach. Boys Volleyball – Our boys competed in the Foothill Tournament last weekend. Our boys made it to the silver bracket and placed 15th overall for the tournament. It was a great showing for our boys. A New way to receive Trojan Thursday is here. Please help spread the word about Trojan Thursday. We went from over 500 people receiving Trojan Thursday to around 70 now with the new way of sending it out. Our athletes receive more exposure if we have more people signed up to receive this weekly update. If you would like to receive Trojan Thursday each week please go to https://unitrojanthursday.wordpress.com and type in your email address. You will receive a notice each week when Trojan Thursday is posted. Baseball – The Varsity Baseball team has played four very good teams the last four games. Although we have struggled, Eric Brunst and Jacob Collins have pitched very well. Also, Max Juang has hit and fielded very well. Riley Smith has been an awesome team mate. Our boys will continue play in the Foothill tournament tomorrow afternoon. Good Luck Baseball. Boys Golf – Our golfers beat Laguna Hills High School last Tuesday and yesterday. Last Tuesday we won 182-212 at Strawberry Farms, highlighted by a 34 (2 under par) from sophomore William Tse. Yesterday we won 171-182 at Laguna Woods. Koichiro Sato shot a 30 (4 under par) for Uni. We are 2-0. Boys Lacrosse – The Boy’s lacrosse team has had two preseason games and is improving with each contest. The Trojans have 4 returning players from last year’s varsity, but the enthusiasm and coach ability of the players that are new to the game is high. The team looks forward to improving each day and having a great season. The last preseason game before they start the regular season is 3/18 against Tustin under the lights starting at 6:30pm. The game of the week is the next day 3/19 versus Sage Hill at 4:00pm. Come out and support the boys and girls teams, it is a great atmosphere and the players appreciate the fans who have been coming and cheering so loudly. Girls Lacrosse – Girls Lacrosse is off to a fantastic start, earning three wins since the beginning of the season. Girls Lacrosse defeated Valencia (10-8), Rosary (7-4), and Tustin (19-6). 9 girls have already scored goals for the team, but Kathy Guo has had an amazing impact on offense scoring 4 goals in each of the first two games and an outstanding 7 goals against Tustin (for a team-leading total of 15 goals in three games!). Anneke Gustafson scored the very first goal of the season on Tuesday, and followed it up with two more in the match against Valencia. The team is playing well and is looking to continue building on this recent success as they take on San Juan Hills and Mesa Murrieta this week. Come and support this fantastic program! Boys Swim – The Trojans boys swim team started off the season with a big win against the Santa Margarita Eagles. The boys posted a 108.5-61.5 victory in the non-league meet. The team was led by Seniors Will Hofstadter, Ken Takahashi, Alejandro Ortiz, Matt Yong, Matt Wong, and Chris Havton. Hofstadter got 1st place finishes in the 50 free and 100 Breast with CIF Automatic times. Ortiz got 1st on the 100 Free and Takahashi got 1st in the 500 free. The boy’s relays got 1st in the 200 Free Relay and 400 Free relay. CIF consideration times were achieved by 13 of the 14 swimmers. Irvine City Swim Relays were held at Woollett Aquatic Center the following day. Our boys placed 2nd place in the team event. Varsity collected three 1st place finishes in the 4X100IM relay, 4X100 Breast relay, and 4X100 Free relay. They got three 2nd place finishes in the 4X100 Butterfly, 4X100 Back, and 200 medley relays. For the 3rd swim meet in 4 school days, the Trojan swim team hosted a match-up with Loyola. Both teams are ranked in the Top 5 of CIF-SS Division 1. The swim meet was decided in the final relay and Loyola prevailed in the end. It was close throughout the entire meet. Trojans took the lead for the first time in the meet after great performances by Hofstadter, Ortiz and Jarod Yoshihara in the 100 Free. The 100 Back event is where the Trojans fell behind. After the 100 Breast Judd Howard, Matt Wong and Chris Havton cut the Loyola lead to 4 points. Overall, it was a great effort by all swimmers. The boys had a lot of fun and it gave them great experience to get ready for the ultimate goal of trying to repeat as CIF Champions. GO TROJANS!!! Girls Swim – At the Santa Margarita meet Lauren Weins posted a consideration time in the 100 back. Joyce Yang also revived a consideration time in the 200 IM and the varsity girls relays also got consideration time in the 200 free relay and 200 medley relay. At the Irvine relays over the weekend the girls posted a faster time in the 200 medley relay. The girls got second at the Irvine city relay championships!! Boys Tennis – Boys tennis continues to play an extremely demanding schedule. Last Thursday our boys beat Peninsula by a final of 12-6. The doubles team of Narris Anukornchaikul and Patryk Kozlowski won all three of their matches. Doubles team Josh Piatos and Hans Hwang earned two points along with Tommy Wang and Rohan Legeweg. On Tuesday our boys fell to Los Alamitos by a final of 11-7. The doubles team of Konrad Kozlowskiand and Rohan Legeweg led the way for us by sweeping all 3 of their sets. Our boys are back at home this afternoon for a match v Tesoro. Good Luck Tennis! Boys Track – Boys Track had a great start to its season in the first meet of the year last Thursday. Our boys came up short on the team score. Outstanding performances came from Aidan Galassetti in the Triple Jump and a win in the 110 High Hurdles, Zane Law in the 800m and 300m hurdles, Tanner Schiedow in the 800m, Carlos Roman, Kay Iwata and Steven Kawana in the 3200m, Vedivat Shetty with a win in the Long Jump and Triple jump and Hamza Diad with a win in both the Shot and Disc. Great job Trojan Track. Our track starts will be competing at the Irvine Invitational this Saturday. Good Luck track. Girls Track – Girls Track competed in their first meet against El Modena High School last Thursday 3/5/15. Girls varsity tied 53-53. In the girls 1600 meter race Janine Bryant and Sarah Stern took 2nd and 3rd place. Sonia Lin and Ami Sheth took 2nd and 3rd place in the 100 meter hurdles. Freshman Paige Metayer impressed everyone with her 1st place finish in the 400 meter at a time of 1:02.16 and 1st place finish in the 800 meter at a time of 2:32.73. Sofya Ogunseitan took 2nd place in the girls 100 Meter Dash. Brook Masterson had an impressive 1st place high jump. Senior Caroline Werth with took 1st place in the long jump and triple jump, and is an athlete to watch out for this season. Daria Shkel took 2nd place in the triple jump, another impressive freshman athlete. In the field events, Melissa Lee killed it with a PR throw in discus at 108’ 10”. Senior Lydia Haug took 3rd place in the discus. The team had an amazing start to the season and we look forward to our upcoming home meet this Thursday against Godinez. 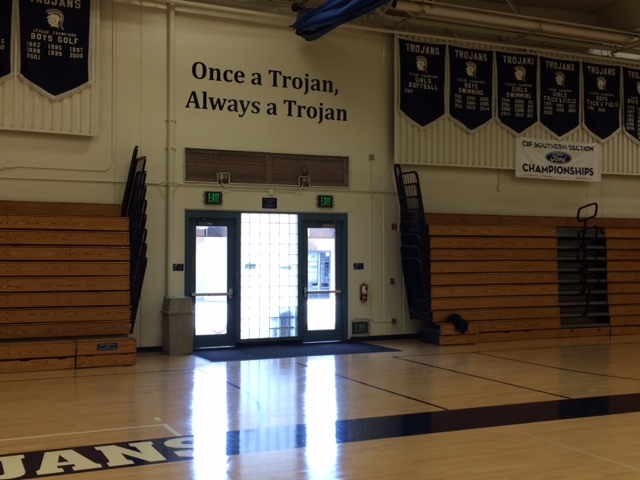 Boys Volleyball – Our boys volleyball team fell to a very talented Aliso Niguel team on Tuesday. 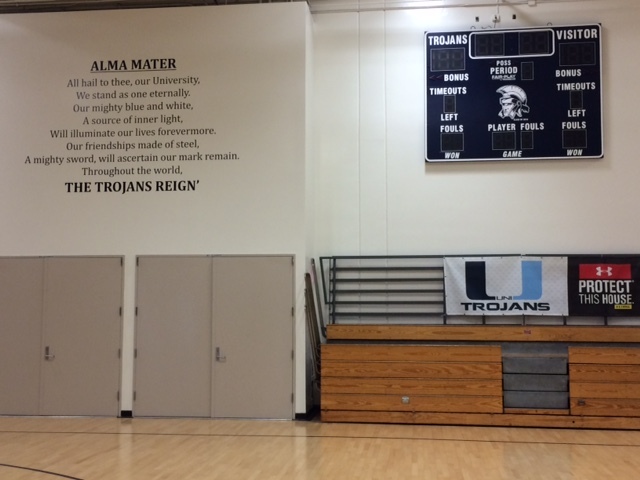 Our boys are back in our gym tonight for a 6:00 game v El Toro. Good Luck Volleyball. ASB Elcetions – It’s hard to believe but ASB elections are here. We will be conducting our ASB primaries on Friday during hoeroom. Students please vote for who you think will do a great job representing UNI next year. 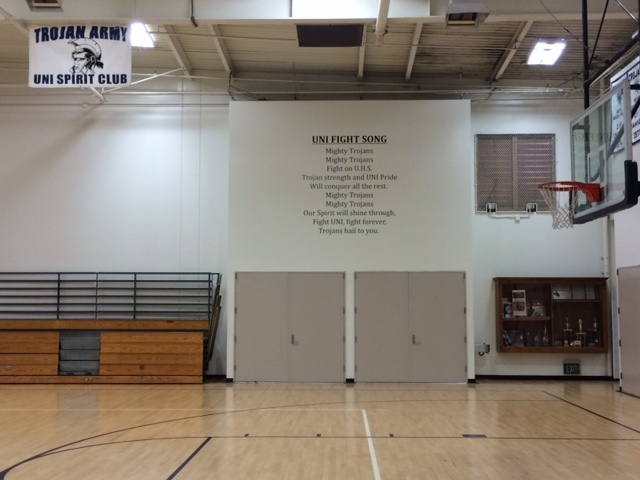 GYM Update – Last Thursday the lyrics to our UNI Fight Song and Alma Mater were placed on the gym walls. We also put Once a Trojan Always a Trojan in the gym. The gym is slowly coming together. The last step is the painting of the UNI logos on the walls. This will take place the week of May 18th. Congratulations to John Farah who came in 8th place at the Wrestling Masters meet last weekend. This finish placed him in the CIF state meet that will take place this weekend. Good Luck John and congratulations on such a great season! Some spring sports began playing games last week. We had a few sports kick off their seasons while others will begin their season this week. Let’s take a look at how our teams did last week. Baseball – Our boys opened their season with a weekend sweep of a doubleheader on Saturday to move to 2-0 . Our boys open play in the Foothill tournament this afternoon. Good Luck Baseball! Boys Tennis –All good things must come to an end. Our boys winning streak was snapped at 117 Matches on Tuesday as we fell to Harvard Westlake. This was our first regular season loss since 2007. This was a battle of two of the top ranked teams in California. Our boys will look to start a new streak this afternoon v another highly ranked Peninsula team. The match starts at 3:15 here at UNI. Good Luck UNI Tennis! Girls Lacrosse – Our girls are off to a great start winning their first two games. We opened with a 10-8 victory over Valencia on Tuesday. Yesterday we won 7-4 v Rosary. Our girls are back at home this Friday v Tustin at 4:00. good Luck girls. Our athletic department teamed up with Copa Cabana Beach Soccer to put on a 5 v 5 soccer tournament last weekend. The tournament was a grass tournament and was held here at UNI. We had 55 teams participate in the tournament with teams ranging in age from Under 8 all the way through Under 19. Our UNI soccer players were well represented as we had 3 boys teams and 2 girls teams participate in the tournament. Not only did our athletes play in the tournament but our boys and girls teams both won the championship for their age group. 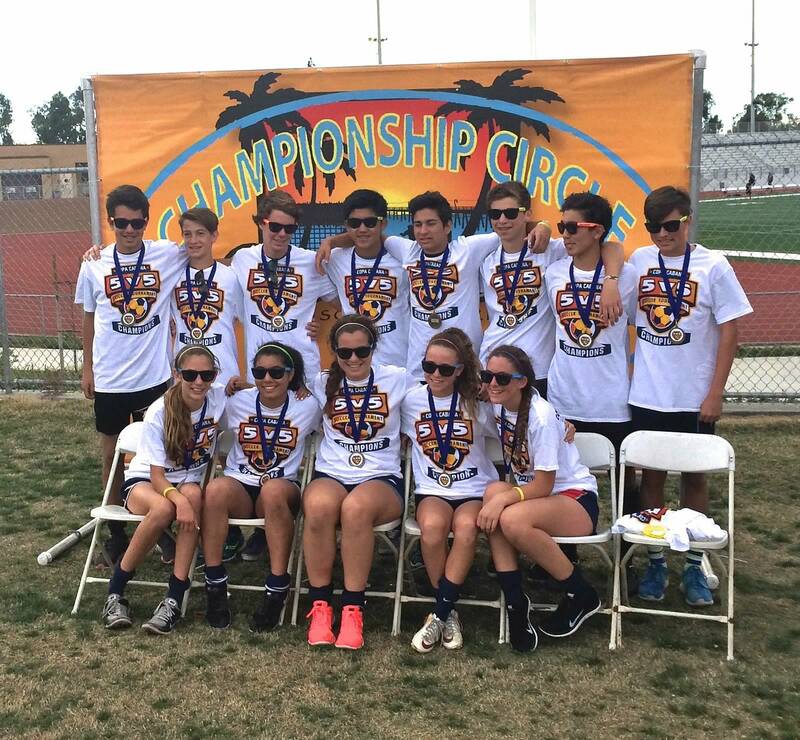 Below is a picture of our boys and girls with their championship shirts and medals. This was an extremely well run event and everyone who participated seemed to have a great time. This tournament will be a yearly athletic department fundraiser and with the success of last weekend’s tournament we are excited for future tournaments.